Happy Friday! Three posts so far this month, colour ME impressed! Why the change? Because I’m so thirsty to keep creating these days! I’ve been taking those Urban Sketchers books I received for Christmas to heart – I have found time almost every day so far this year to pull out my sketchbook and draw something. Anything. I really like the concepts they emphasize, that you can draw literally whatever is in front of you, that you don’t need to strive to always have something that is finished, and MOST importantly – STOP trying to be perfect. Sketching is about the process, not the finished product. It took me a long time to grasp that – while I love to see the end product of what I create, I fall in love while actually making it. It was sometime last year that I really started focusing on my love for the city I’ve grown up in too – so why not start sketching it? I walked around one sunny afternoon in September with Frank taking photos all up and down 4th Street in Mission – which is great because Frank’s office is now right over there. Then another day I went out all on my own and took shots of 17th Avenue. I went to high school at Western there, so I definitely associate a good deal of nostalgia with that area. I bought my first art supplies from Mona Lisa, just off the corner of 17th Ave and 6th Street, and to this day that is still where I go to stock up. Anyways! Enough of memory lane. The title is self explanatory: new year, new hashtag. Check out my Instagram account if you aren’t already following me – I’ll be posting sketches around the city at least once a week for the foreseeable future. I want to increase that amount too, in good time. And start adding colour. And start creating finished pieces of my work for a gallery wall. These things tend to run away with me. This entry was posted on Friday, January 16th, 2015 at 9:43 am. 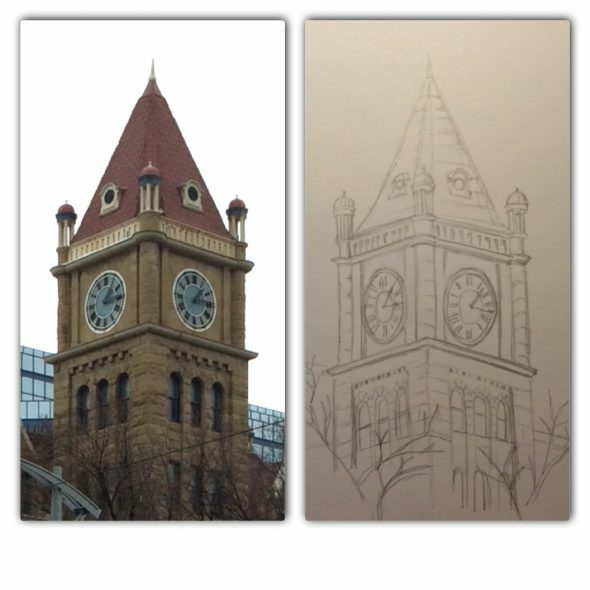 It is filed under General Musings, Sketching YYC and tagged with Design by Streetlight, Downtown Calgary, Musings, new years resolutions, yyc blogs. You can follow any responses to this entry through the RSS 2.0 feed.